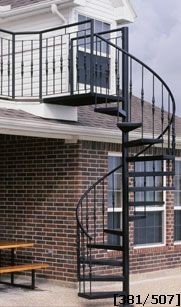 A fully assembled exterior spiral stair, 60" diameter, and has a landing and balcony rail to match. The handrail is # 200 (1 1/2") round steel tubing; spiral staircase balusters are # 326 (hammered forged) tapered from the ends, up the center to a collar - two per tread; and the treads are a # 110 (12 gauge) checker plate steel. The checker plate landing is a custom 90 degree rectangular shape with 42" rail, two sides, and top handrails and balusters to match the spiral stair. The center column is a 4" OD .135 wall tube. The spiral stair was shipped with a standard coat of red oxide primer, and a coat of our standard black paint. Spiral staircases are common on exterior decks - space saving, economical, minimal visual distractions, and can have components to fit any design style. Any rail design on spiral stairs can be incorporated into railing around a deck. Stairways, Inc. will fabricate guard rail or balcony railing to your specifications. When ordering railing for your deck, supply dimensions of the outside facing of your deck. Stairways, Inc. will then supply a drawing, with dimensions, for your approval.